ViaNiños in Germany and Switzerland send volunteers to our partner organisations CENIT and UBECI. Click here for more details. In the UK we do not have a formal process for sending volunteers, but we are happy to answer any of your questions about volunteering and put you in touch with our partner organisations. 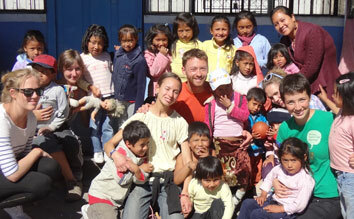 A volunteer placement in Ecuador is not only an invaluable help to the partner organisation but an also an unforgettable and rewarding experience for the volunteer. We are always looking for volunteers in the UK who are interested in helping with fundraising. This could be anything from helping us with events in and around London, running an event local to you, writing grant applications, seeking corporate sponsorship or working with your local school. Or perhaps, you are thinking of taking part in a sporting challenge and are looking for a charity to support? Whatever it is we want to hear from you! Please contact us at info@vianinos.org or join our facebook page to keep up to date with fundraising events.